When it comes to marine-grade stereos, not all systems are created equal.. When choosing speakers, it pays to purchase a marinized product that can stand up to harsh conditions such as FUSION's Signature Series speakers, which are specifically designed for on-the-water usage. 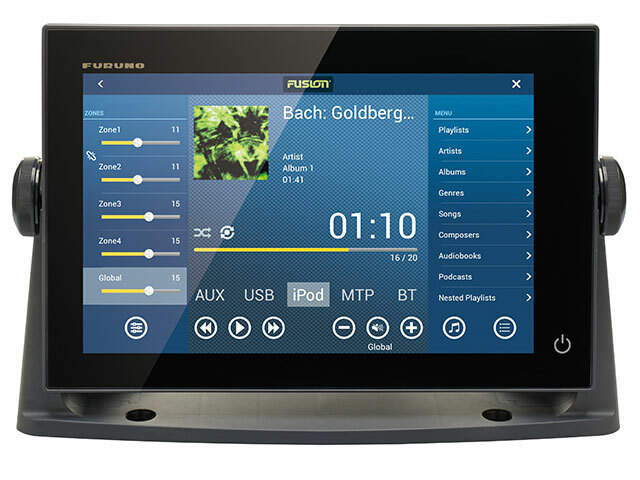 FUSION's stereo units are built for the marine environment and allow you to stream music from a number of sources. 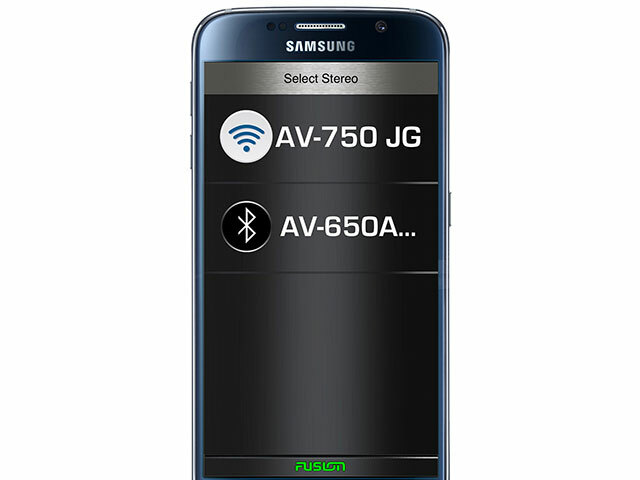 Bluetooth capability allows you to sync up your FUSION unit with smartphones, iPods and tablets. You can also sync up your system to a MFD for seamless media control. 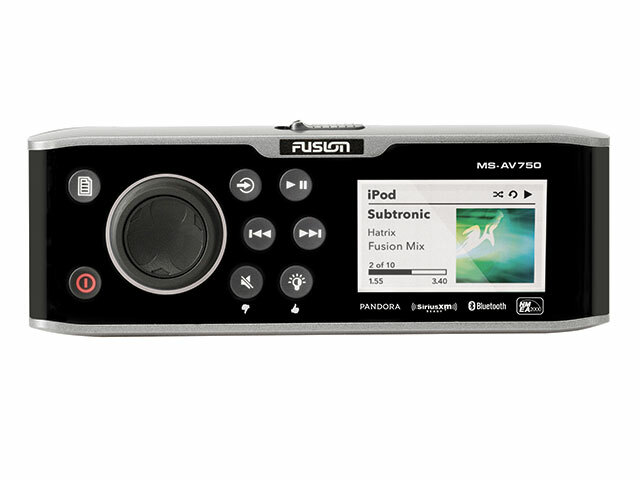 With the FUSION 750 stereo, you can play music off of your smartphone while keeping it protected from the elements. It also charges the phone while underway. Today's marine audio systems are much more advanced than anything we've ever seen in the marine marketplace. The days of installing a car stereo under the helm are long gone, thankfully. Those stereos typically only lasted a year or two as the saltwater environment quickly ate away the internal components. Marine entertainment systems now link to smartphones via an aux cable, wifi or Bluetooth to play digital files and in many cases will charge the device as it’s being used. From apps to chartplotter connectivity and waterproof speakers (that are sometimes lit-up with LED lights), there is a lot to consider when shopping for a marine entertainment system. To help FishTrack readers get a sense of what to look for in their next marine audio system, we interviewed the lead designer at FUSION Entertainment, makers of the top marine-grade entertainment systems on the market. Q: What are the most important characteristics that go into a marine-grade speakers when it comes to being corrosion resistant? A: What tends to happen in our industry is those well-respected car audio manufacturers will simply bring their product line over to the marine market hoping to solve a boat problem with a car product. For any electronic, the marine environment is by far the harshest and most unforgiving. Water ingress, salt spray, UV exposure and moist air are everyday hazards. To effectively combat these environmental pressures, while at the same time deliver outstanding audio quality they need to be factored into the design process, hence FUSION’s True-Marine. FUSION’s cone is constructed from an engineering process known as CURV. The CURV cone is actually a series of polypropylene tapes which are woven together and heat pressed to form a self-reinforced composite. This cone is lighter, stiffer, with higher damping than the standard polypropylene cone found on all other “marine” speakers, making it ideal for marine application. CURV has superior tear resistance, is impervious to moisture and is highly tolerant of extreme temperature and UV exposure. FUSION’s floating tweeter suspension allows the cone to move unrestricted and actually provides greater surface area for increased sound output. The tweeter dome is manufactured from silk to deliver crisp high-end acoustics, protected by a hardened stainless steel tweeter cap to prevent damage. The silk tweeter coupled with the CURV cone deliver greater sound definition, a higher output and unparalleled resistance to the marine environment. Built from toughened engineering plastics, the entire grille and basket assembly is designed to not only withstand constant UV exposure but also direct knocks or blows which occur quite regularly on choppy sea. Every single Signature speaker and subwoofer is waterproof tested on the production line before shipping into market. Yes, every single speaker is tested. To ensure the best sound possibly we’ve included gold plated terminals for better connectivity, all included speaker wire is fully tinned and stainless steel mounting screws are included to prevent corrosion. Q: What is the secret to maintaining good quality sound in a marine speaker? 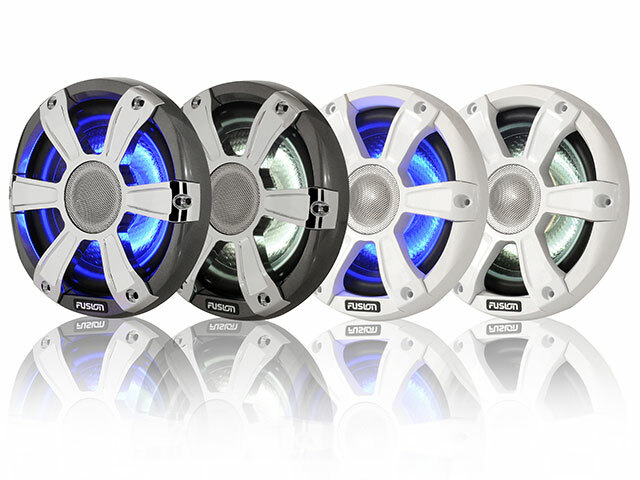 A: When it comes to speaker design FUSION has focused on engineering our Signature Series for those who appreciate all different music genres by only working with the highest quality materials and tuning the frequency for a more flat response. In terms of delivering the best music possible, speaker placement and amplification play a huge part in how the Signature series perform. By pairing with the right FUSION amplifier and ensuring the bass notes are covered with a Signature Subwoofer you will create musical perfection. By using only the highest quality materials we can allow the user to adjust the volume on their stereo without causing unbearable distortion. Q: Whose idea was it to add light to the speakers? A: At FUSION we’re constantly pushing the boundaries of what is possible on the water and with the quick adoption of underwater LEDs it was only a natural progression for lighting to be integrated into our marine speaker range. To ensure uncompromised waterproofing the LEDs are protected by a fully sealed diffuser cap, which not only projects a soft glow and allows the Signature series to receive a 3 year warranty – the best warranty offered to any speakers in the marine market. For those who appreciate music and demand quality, the Signature series is the only option. Because we’re a marine company we didn’t want to include every color under the sun as colors like green and red are common nautical lights. This is why the LED options on the signature series are limited to blue and white. A 12-volt connection has been incorporated into the basket design and to change the glow you simply alter the polarity of the wires. 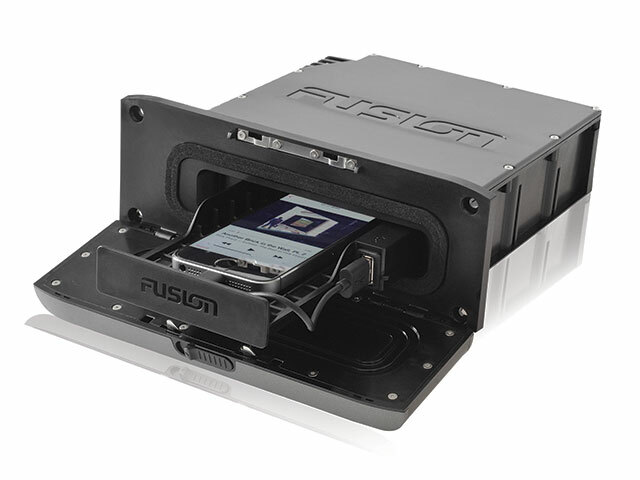 FUSION also offers an accessory regulator that allows up to 10 speakers or subwoofers to be connected. The regulator will ensure a constant voltage is delivered to every speaker on the boat meaning fluctuations in voltage caused by engine acceleration and other devices does not affect the glow on the speakers. The regulator also allows the user to adjust the speaker glow between blue and white with a simple switch. For more information on FUSION visit fusionentertainment.com/marine.